WHISTLER, BC, August 30, 2017 /24-7PressRelease/ — From single to dual axes, and couples to groups, axe throwing is an activity on the rise in the Sea to Sky Corridor. Function Junction-based Forged Axe Throwing has expanded from their current location with four axe throwing cages to offer a mobile unit, which premiered during the destination’s popular Tough Mudder. In addition, the team at Forged has had their mobile unit in Squamish for a number of events this summer including the Squamish Beer Festival in partnership with the Squamish Days Loggers Sports Festival. The growth of axe throwing has been phenomenal. Since its humble roots in Ontario, axe throwing has taken over Canada and many cities in the United States as well. Forged has seen their cages full almost daily since opening in May. And the popularity continues to grow. BATL, a Toronto based axe throwing chain will be opening in Squamish on Sept. 17, 2017. BATL will join the other two other operators in the region: Forged Axe Throwing in Whistler, and Axewood at the Sea To Sky Gondola. “Squamish is definitely ready for a dedicated axe throwing venue and we’re super excited to welcome BATL to the region,” says Anderson. To learn more about Forged Axe Throwing, call Forged at 778-770-2240 or email [email protected]. For more information, visit www.forgedaxe.ca. 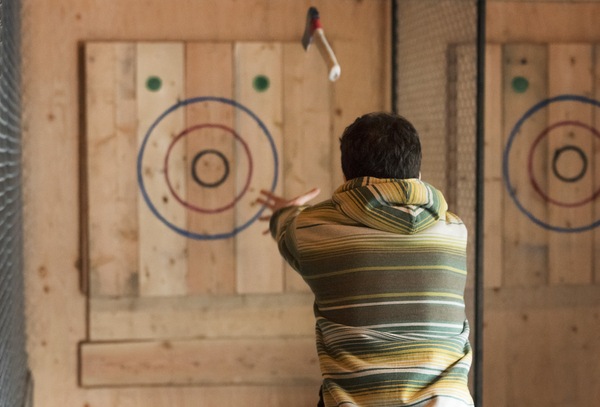 Set in Function Junction beside Coast Mountain Brewery, ten minutes away from the village, Forged is an axe throwing venue with four targets and can accommodate parties up to 30 people. Forged Axe throwing is open seven days a week for axe throwing events and drop ins. Forged is also proud to be a supporter of Zero Ceiling; a portion of proceeds is donated to help them achieve their mission of reducing youth homelessness. For bookings please call (778) 770-2240.